This is an excellent example of a portrait session after the wedding. The bride and groom rode in a boat from the ceremony to the reception. Their hair was windswept, and they were a bit disheveled. The bride and groom were having so much fun taking their portraits! Even though they were missing a bit of their reception. It shows in the smiles that they were giving me throughout the whole portrait session. The bride is a yoga instructor and felt connected to the nature of her surroundings. The bride and groom had their wedding ceremony at the home of his family. 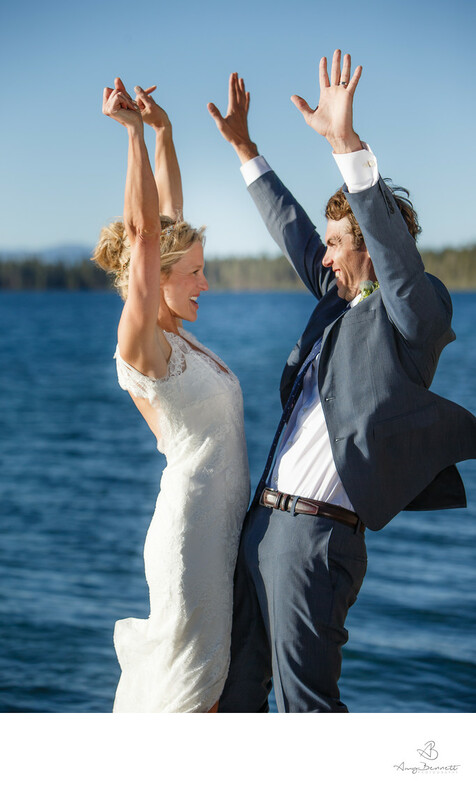 They were married in a rustic Lodge, at the fallen lake lodge. It was a quintessential Vermont wedding. I had some difficulties when I took this photo because the light was so bright. So I turned them away from the sun, and balanced reflected light at them. This illuminated their face and made it possible for me to take a photo of them and not have them in a dark silhouette. Many colors stand out in this photo including the dark blue of the lake and the green in the trees. It was fun how the bride and groom decided to use their boat. Keywords: engagement shoot (603), vermont engagement (603), vermont engagement photography (603), vermont photography (912), vermont wedding (927), vermont wedding photography (1098), WEDDINGS (576), WEDDINGS IN VERMONT (657).